THE KASHMIR POLICE and militants have followed an unwritten code of keeping their fights to themselves in all these years of conflict. But, not anymore. On August 31, militants raided homes of several policemen in south Kashmir and abducted their relatives. The unprecedented action created panic in the families and the top rungs of the police force. The families of policemen—especially those unconnected with the Special Operations Group (SOG)—have never before been targets of militants. The change in tactics came after the police in Shopian allegedly tried to torch the houses of two Hizbul Mujahideen militants, Shahjahan Mir and Syed Naveed, in retaliation to the killing of four policemen at Arhama on August 29. Both Hizbul and Jaish-e-Mohammad militant groups had owned up to the killings. On August 30, Hizbul militants abducted a policeman’s son, Asif Rafiq Rather, from his home at Tral, in Pulwama. His mother, Hameeda Begum, came in a video message and appealed to the militants to release her son. “You are also my children. I request you to set him free,” she pleaded. While looking for the abducted boy, the police took away the Hizbul’s operational commander Reyaz Naikoo’s father, Assauddlah Naikoo, and arrested the father and brother of another militant, Lateef Ahmed Dar alias Lateef Tiger. The Hizbul reacted by abducting 12 relatives of policemen from three districts—Shopian, Pulwama and Kulgam. Most of them were released after a night in captivity. The militants, however, released videos of the abducted people urging Director General of Police S.P. Vaid not to harass militants’ families or damage their homes. In one such video, Zubair Ahmed, a PhD student, whose two brothers work in the state police, said, ‘’I want to tell S.P. Vaid, please do not vandalise the homes of the militants. They can do the same to us. Today they are pardoning us, but next time they will not spare us.’’ In the video, a militant can be heard asking Ahmed whether he was beaten or coerced. ‘’No, I was not,’’ he replies. The militant then tells him that it is the first and the last warning to the police. THE WEEK met several of those abducted by the militants, but only a few were ready to speak about what happened. 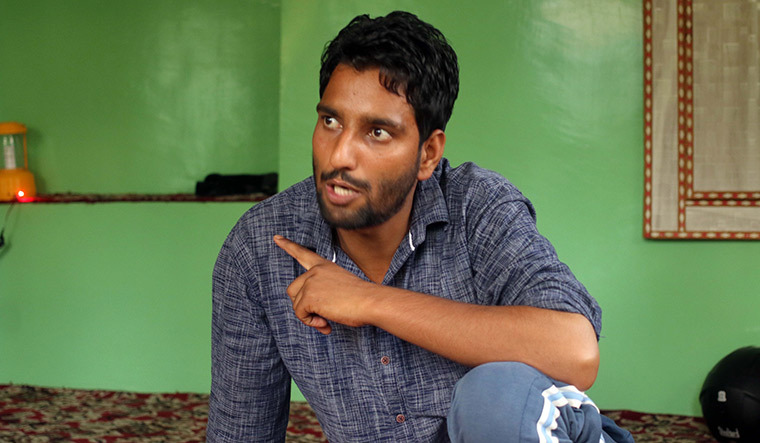 One of them, Yasir Arafat, the son of sub-inspector Bashir Ahmed Bhat, said he was in a room on the ground floor of his house when two masked men arrived and asked him to come out. ‘’When I came out they asked me for directions. Other militants were waiting for them some distance away,” he said. Arafat was then blindfolded and put in a car. ‘’After some time, the car stopped and they took me to some house. I told them I was feeling some discomfort in the abdomen and they got me a tablet.” Then, he was given a glass of water and a blanket. Arafat thought that he was being taken away because he had applied for a job in the police. “My name was not on the list of selected candidates. I thought maybe they knew I had applied for a police job,’’ he said. But, the militants told him that his abduction was intended as a warning to the police. In another village in Kangan, constable Khursheed Ahmed was sitting on the veranda of his house when I met him. While in captivity, Ahmed had also appealed to Vaid not to harass the families of the militants. As I met him, he pretended to be his brother, but on being shown the video, he discarded the pretence and invited me inside his house. ‘’I was not sure who you were,’’ he said. ‘’The other day two militants came and asked me to issue an appeal to the DGP, and I did. I will not support or do anything that goes against human dignity and morality. I appealed to the DGP in the video not to vandalise and intimidate the families of the militants as it will jeopardise our security.’’ He said he had joined the police force after his postgraduation in finance and taxation. 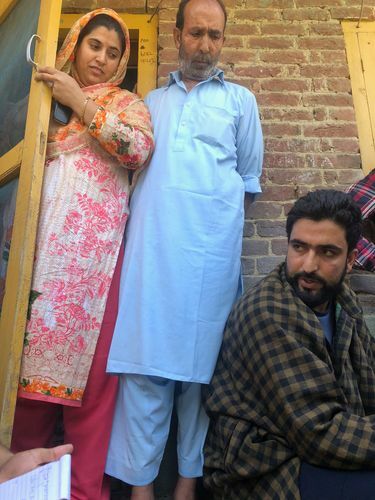 In this prosperous village, one has to pass through several narrow lanes to reach the house of Ghulam Muhammad—the father of constable Abid Hussain—who also had made a video appeal to the DGP. “My son is a special police officer (SPO). He is not involved in anti-militancy operations,’’ he said, before leaving for maghrib namaz, the fourth prayer of the day. In Kulgam, 47km from Pulwama, Faizan-ul-Bashir Makroo, a BCA student, was taken away from his house at Frisal. 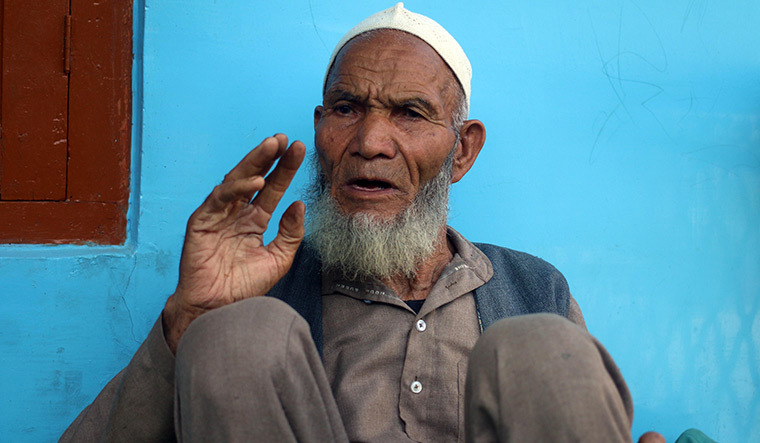 His mother, Aisha Begum, said the militants told him to lead them to the house of his uncle, a police constable. The boy was released 48 hours later, after she implored them to release him in a video appeal. Still terrified, the family is now planning to relocate. Naveed’s cousin Mehooda said the policemen in pheran had come in a private vehicle. “They ordered us out before setting fire to the room,” she said. Her maternal uncle Ghulam Rasool showed a heap of burnt drapery in the courtyard. “Why are they doing it to us?’’ asked Yasin. “Let them deal [directly] with Naveed,’’ he said. 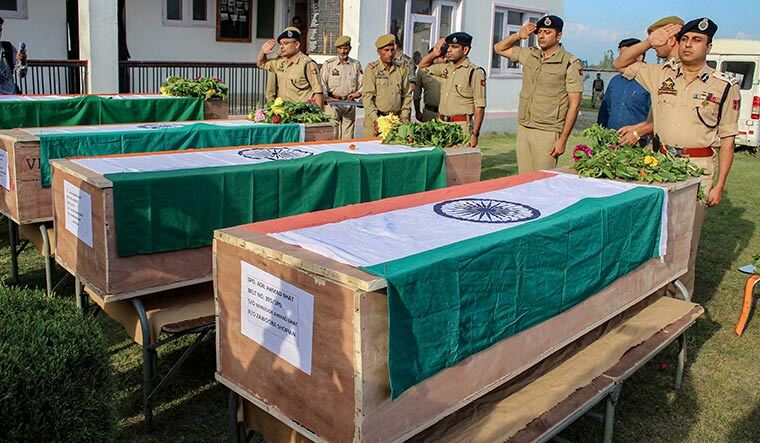 The abductions and increasing tensions have demoralised many policemen in south Kashmir. 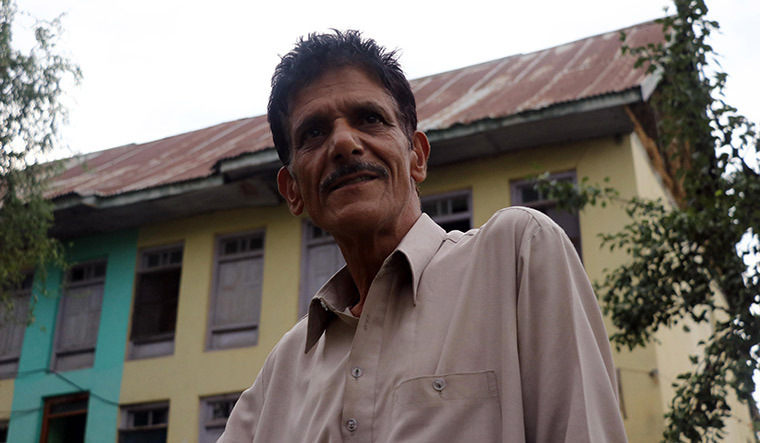 Gulzar Wagai of Arihal, an SPO, resigned from his job a day after the militants released the abducted men. His mother, Halima, said that he announced his resignation during Friday prayers in the local mosque and asked people to forgive him. Halima and her daughter Amina were busy packing freshly plucked walnuts in gunny bags. Some lay spread on a sheet of cloth for sunning in the courtyard. “He [Wagai] has gone to pluck walnuts from the orchard with his father. He will be home later,’’ said Halima. She said her son had liked the job in police, but could do without it. “Life is important, so we decided he better quit.’’ Besides having walnut cultivation, they supply cheese to the whole area. Another senior police officer told THE WEEK that there were 21,000 people from south Kashmir in the police; it was not possible to house them in barracks, unlike other security forces operating in Kashmir. He said the police had an “organic link’’ to society that could not be severed, and claimed that the police had handled the situation with a lot of care and ensured that there was no “extrajudicial activity’’. But Kashmiris are now in a new phase and at each other’s throat.